Welcome to Alaska Antler Works! Alaska Antler Works was created in 2002 when we lived in Alaska. We lived there for over ten years, but have since moved our family back to Montana for most of the year! We are changing our name to MONTANA ANTLER WORKS to better represent our location! We are slowly creating a new website but will keep Alaska Antler Works up for the time being. 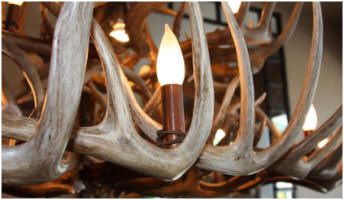 Our custom antler lighting and furniture are made from deer, elk, caribou, and moose shed antlers. We specialize in large Alaska-Yukon moose antler lighting and furniture, and enjoy working with elk and deer antlers from Montana. We find many of the antlers we use; each antler is unique and tells a story. Our handcrafted antler furniture is perfect for your backcountry lodge or rustic home. Aaron and Jill Bork have a passion for antlers and it shows in the fine craftsmanship of their antler lighting. We enjoy creating the perfect centerpiece for your home. If you have an idea of an antler accent and don't see it on our site, let us know and we'll gladly do the groundwork to make your vision a reality. Aaron handcrafts each piece himself and it shows in the detail of our antler tables and the symmetry of our antler chandeliers. If something smaller is what you had in mind, we also offer a wide range of unique antler gifts including scrimshaw antler cribbage boards, antler wine racks and bottle openers, and antler carvings. If you are looking for trophy moose antler taxidermy sets we have started to sell a few antlers. We are excited to be printing our own antler and adventure shirts with designs coming for many western states. If you've browsed through our antler store and have any questions about who we are you may find it enjoyable to click through our archive of Alaska adventures. We currently are living in Somers, Montana (near Kalispell, MT) with frequent travel to Alaska. Look for us in 2019 at the Whitefish Art Festival and Bigfork Festival of the Arts.